Moose Haven is a 2,200-square-foot, 3-story, 4-bedroom, 2-full bath modernized vacation log home located 6 short miles from West Yellowstone. The home sleeps up to 12 people comfortably. There are two large spacious living rooms, a modern kitchen, full washer/dryer facilities. 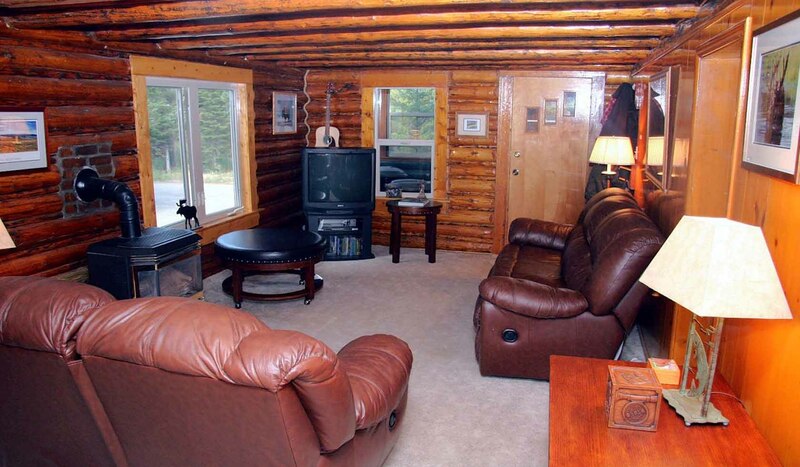 Our wonderful log home has all modern amenities. The main floor is complimented with the natural logs, is quiet, cozy and comfortable. There is a large living room, one bedroom, and a full bathroom on this floor, along with the kitchen and dining room. Upstairs are two bedrooms, one large room with a king size bed. The other with three single beds. Downstairs is another full, large living room, a master bedroom, a full bathroom, and a full service laundry. We also have High Speed Internet, Direct TV, TV/VCR/DVD players, a variety of CDs and DVDs and games for your use. Provided for your comfort are all paper goods, silverware, linens, towels, and blankets. There is a fully stocked kitchen with dishwasher, range, microwave, and all the cookware. The dining room table will seat eight. Before dinner enjoy a glass of wine on the deck while watching the sunset on the mountains. In the morning watch deer, moose, and birds while sipping your morning coffee. On the deck there is a comfortable patio set and gas grill. A fire pit is available off the cabin deck that is great for telling stories around the fire and watching the stars light up the Montana Big Sky. We are immediately adjacent (within 1/4 mile) to the Gallatin National Forest. There is immediate access from Moose Haven to over 500 miles of mapped groomed, snowmobile trails including Yellowstone National Park. Only 2 miles from Hebgen Lake, a short eight-minute drive from Yellowstone National Park and within 60 minutes to all fisheries inside and outside Yellowstone National Park. We are also within 90 minutes of the South Fork of the Snake River in Idaho, a famed fly fishing river. All of our guests find out very quickly just how handy it is to be very close to all activities, snowshoeing, cross-country skiing, snowmobiling, hiking, mountain biking, rock climbing, bird watching, horseback riding, and of course Yellowstone National Park, which only 10 minutes away. Don't want to drive around? Well then settle back for a BBQ on the spacious outside patio, or build a campfire in the fire pit for a evening of fun. In the mornings head out back with a fresh cup of hot coffee and enjoy moose, deer, a variety of birds, squirrels, marmots, and other wildlife literally wandering around the area.